We are professionals (that is, we make our living in this business), and treat our work and our clients accordingly. We like it when our clients say they have found our approach very professional, and most of them do. We'll bring with us what any professional sound-engineer should bring (including headphones, PVC tape, Sharpies, blank channel lists, tools and basic test equipment), and as far as humanly possible will leave everything as we found it when we depart (picking up cable ties, bits of gaffer or PVC tape, plastic coffee cups and anything else we have used as we go). One key factor shared by all the engineers who work for us is that they are themselves musicians: as well as knowing how to manage gain structure, dynamics and frequency content, they understand musical arrangement, production and balance. Familiar with all the ‘nuts & bolts’ of a PA system (from controller settings, connections and loudspeaker positioning to microphone selection and placement), they can combine their technical ability with their shared love of music to create a good mix and get it across in every kind of environment. Tony Lloyd, who founded Astralsound in 2001, is a very experienced sound-engineer. With a career in the music industry spanning over 30 years, he started engineering live shows in 1982, and since then has mixed literally hundreds of acts - covering a wide variety of genres and shows - in every kind of venue from Arts Cafe to Zoo. Other sound-engineers currently include Nikhil (‘Niks’) Patel from Ragged Moon, who has worked on and engineered many Astralsound (and other) events since he joined us in early 2014, and Paul Bryant from Lightquest (who has considerable recording as well as live engineering experience, also dating back to the 1980s). 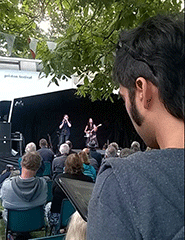 Our sound-engineering crew have worked from front-of-house and side-of-stage in small venues and large, indoors and outdoors, with a wide range of performers and styles. They have worked on every kind of PA system from compact powered speaker to concert line-array, on every kind of desk from mini notepad to large-frame digital console. They have mixed everything from solo a cappella to thrash metal, from Chilean flutes and African drums to synthesizers and vocoders. If you can provide the music, we can provide someone who knows how to mix it.